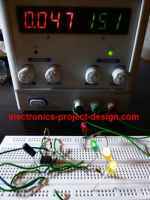 This 5-15V regulated power supply project is a simple power supply that has a variable DC voltage range from 5V to 15V. It can supply current up to a 400mA to power the various circuits for your electronic projects. The voltage output is varied by using the potentiometer VR1. In this circuit, the input line power supply is designed for 240VAC. If 110VAC input is used, change the ratings of the varistor to 150VAC and the transformer ratio to 110V/12V. Fuse F1 is used as a protection in case there is any short circuit in the circuit. Varistor V1 is connected in parallel to the input of the line voltage to clamp the surge voltage from the line to a reasonable level that helps to protect the transformer and other circuitry. Once the voltage level surge to a high level beyond the ability of the varistor to absorb it, fuse F1 or varistor V1 or both will burn. If this circuit failed after a period of operation, check that the fuse and the varistor are still in good condition or else replace them. Diodes D1, D2, D3 and D4 are used to rectify the 12VAC voltage to DC voltage. Electrolytic capacitor E1 is used as a smoothing capacitor to reduce the ripple of the DC voltage. The DC voltage is fed into the input of 7805 regulator where the output DC voltage is obtained. Changing the value of VR1 will change the output of the DC voltage. Capacitor C1 is used to filter out high frequency component from the power supply.